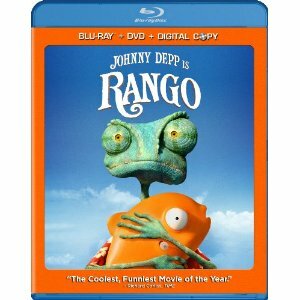 WorldMovieStore - Rango Sinopsis. An animated Western with a chameleon as the hero is an unlikely concept, but Rango is a great film thanks to its witty mix of parody, intriguing characters, and sophisticated humor. When a common pet chameleon who's suffering from an identity crisis crashes headfirst into the stereotypically classic Western town of Dirt, he has the unique opportunity to completely reinvent himself. The animation looks great in this film and kids will love the goofy characters and crazy scenarios. --Tami Horiuchi. Read More Sinopsis. 0 Response to "Blu-ray Release Rango"